I am back to reality after an absolutely wonderful Thanksgiving vacation in San Francisco. It was great to spend time with family and my ridiculously adorable niece. I can't even stand the cuteness. We had a delicious Thanksgiving meal filled with our family favorites. While that was great, one of the best meals we had in California was fresh cod and Dungeness crab my brother caught while deep sea fishing. We enjoyed the meal standing up over paper bags for easy cleanup. Amazing. Are you tired of pumpkin recipes yet? I hope not, here comes another one. A few of the ingredients in this soup might sound like an odd grouping, pumpkin, peanut butter, mango nectar. Trust me, it works. This soup is so incredibly simple. I decided to make this at 1 PM one day. I purchased the groceries, made the soup, took pictures, and was eating by 2 PM. 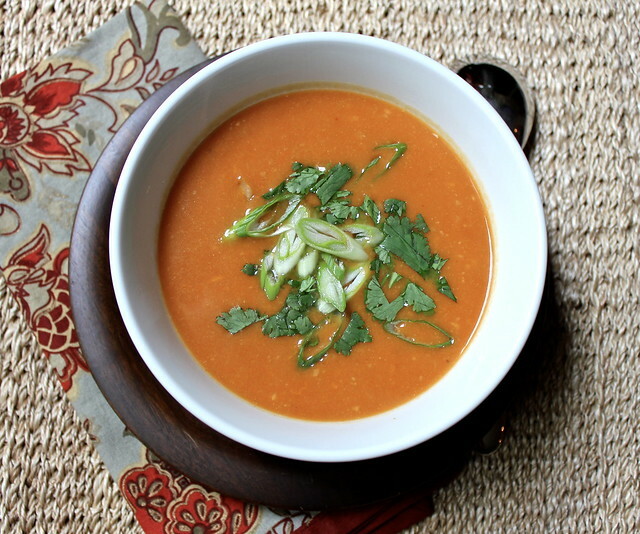 Thai Pumpkin Soup is really light and would be great paired with a grilled sandwich or salad. It is pretty low in calories and fat and has healthy fiber from the pumpkin. Good stuff. Add the chicken broth, pumpkin, and mango nectar to a large pot over medium heat. Bring to a boil, cover, reduce heat and simmer for 10 minutes. Meanwhile, add the peanut butter, curry paste, and garlic to the bowl of a food processor. Add one cup of the pumpkin mixture to the processor, pulse until everything is well combined. Pour back into the pot. Add the ginger, zest, and vinegar to the pan. Taste for seasoning and add salt, pepper, and pepper flakes to taste. Serve with chopped green onions and cilantro.